1 : 490000 Prang, L. & Co.
War Telegram Marking Map. Produced by Prang in 1862, this War Telegram Marking Map was published for sale with the intension that telegraph communications within what the map calls ‘Virginia Territory’, the area running from Baltimore to Petersburg across the Union and Confederate line, would me marked down. The explanation key on the map comments that red and blue pencils would be provided alongside the map so that Union telegraph communications could be marked in red and Confederate communications in blue. This map is unmarked. L. Prang & Co.
Seat of War in America. Published by Bacon & Co. in London, Seat of the War in America shows the region between Baltimore and Petersburg and the placement of troops and fortifications along the border between the Confederacy and the Union. It is notable how many batteries are placed around the Confederate capital of Richmond, as well as marking out the railway lines that connected the region. At the top of the map are publishing adverts for Colton productions, as well as a list of the Union and Confederate generals and a table detailing export amounts in 1860, with cotton being the largest figure. Bacon & Co.
Central Virginia showing Lieut Gen'l U.S. Grant's Campaign and Marches. 2d Corps A.N. Va., camps, pickets, routes. 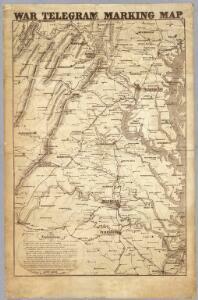 Map of the Region between Gettysburg, Pa. and Appomattox Court House, Va.
1 : 285120 Weyss, John E.
Delaware And Maryland. (with) District of Columbia. 1 : 970000 Colton, G.W. Climatological map of the State of Maryland and the District of Columbia. Map of Maryland and the District of Columbia geological formations. 1 : 633600 Tyson, Philip T.
1 : 930000 Goodrich, S.G.
1 : 950400 Bradford, Thomas G.
1 : 760320 Lucas, Fielding Jr.
1 : 1837440 Henshaw, Frances A. 1 : 887040 Lea, I. Publisher: Prang, L. & Co.